There's no time quite like May to explore the island of Capri, which has been attracting visitors with its majestic aura and natural beauty since, well, the time of the Ancient Greeks. A stunning setting for honeymooners, you'll be able to blow off post-wedding steam at romantic beaches, indulge in views of rainbow-painted houses and seaside cliffs, and sunbathe in picture-perfect weather. 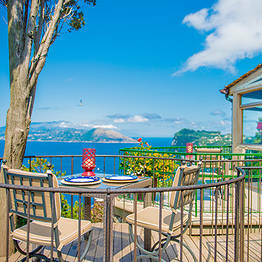 At the only five-star, 55-room boutique hotel on the island, Hotel Caesar Augustus is perched on a next-level picturesque cliff overlooking the Bay of Naples. Sure, the hotel may have the finest aspects of ancient Roman architecture with Italian furnishings, but it also offers 21st-century conveniences and luxurious amenities to ignite your romance. Take a dip in the infinity edge pool overlooking the ocean, followed by a sunset dinner for two at a private cliffside table.